Charity Event + Karaoke = Fun! Can You Help the Local Community D.A.R.E. Program? I’m reaching out to you today to help our local community D.A.R.E. program. The primary goal of D.A.R.E. (Drug Abuse Resistance & Education) is to prevent the use of tobacco, alcohol and drugs in the lives of our youth. This is a voluntary program supported by donations from individuals and businesses. Donations for the D.A.R.E. program are tax deductible under IRC section 170 (c) (1) – a donation letter can be provided for your tax write off purposes and donors are recognized in the community D.A.R.E. publications. The program brings a D.A.R.E. officer and education materials into 5th grade classrooms once a week for 3 months. Students actively participate in class and take a stand against drugs and violence. This is such a critical age of influence and decision making for our youth. The old adage ‘an ounce of prevention is worth a pound of cure’ is very true in this day and age when you look at what challenges our kids are facing. The 2011 Fund Raising Drive needs a total of $10,068.00 for supplies that include workbooks, bumper stickers, Graduation t-shirts, Awards and Medallions. Know Anyone with Needs?? "Day of Service" Will Help Our Community!! 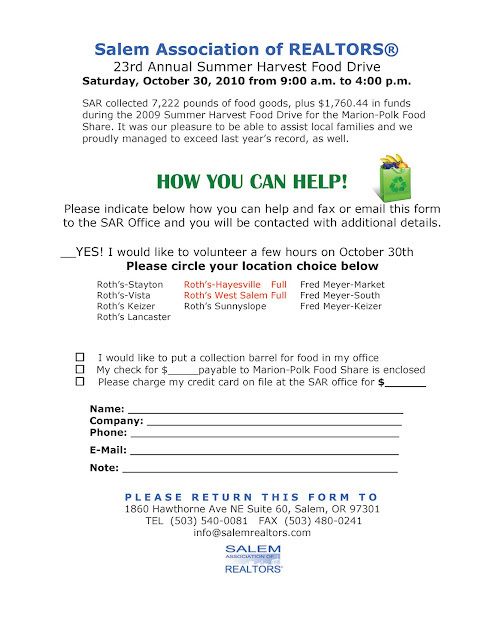 A local charitable organization is planning a “Day of Service” for September 17, 2011, in the West Salem (first priority) and Salem areas. They are seeking contact information at the earliest possible date (Name, Address, Phone Number) of individuals and families that would benefit from an effective 5 to 15 hours of “kindness service” on or about their home, such as yard clean up, painting, fence repair, or the like. Each household would have anywhere from two to five individuals (or more, if needed) to address the required work in a two to four hour period, thus the 5 to 15 hours of “effective service”. Have any clients / family / friends who could use this helping hand? Submit your project suggestions to gary@inetrealtors.com. The “service” to be provided is totally free and without any strings or expectations attached. They want to do something wonderful for our community, and I’m hoping they get lots of takers! Play Poker (or Bunco) for Relay for Life – Polk Co Assoc. 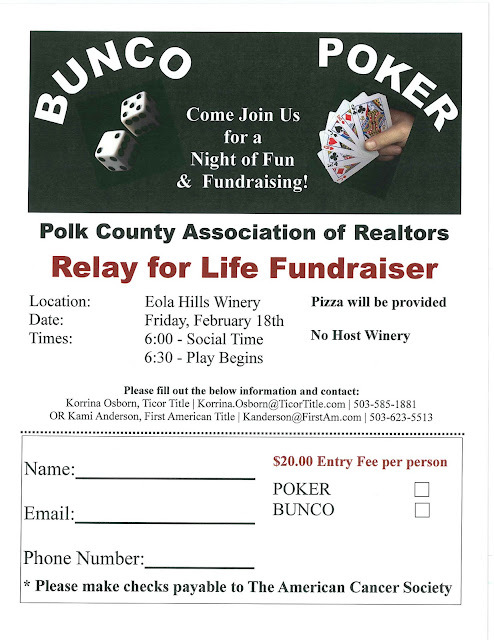 of REALTORS® Event February 18!